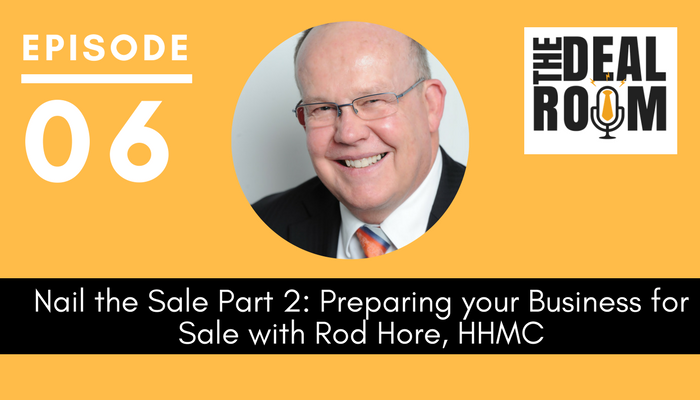 This episode is the last part of our exciting two-part series in preparing your business for sale with Rod Hore of HHMC. In the last episode, we talked about targets, challenges, options available, deal structure and the top areas to prepare for, for SME’s; and in this episode, we’ll focus on medium and large businesses, how to identify them and the top five areas to getting the business in a sale-ready state. Joanna: Hi Rod and welcome back! I’m glad to have you on the show again, talking about preparing your business for sale. Rod: Thanks Joanna. It’s a pleasure to be here. Joanna: Great. So today we’re launching into part two of our two-part series. Last episode we talked about preparing for sale for SMEs. But today we’re talking about medium to large companies. I guess maybe we should start off by clarifying what we mean by medium and large businesses as opposed to the SMEs that we were talking about in the last episode. 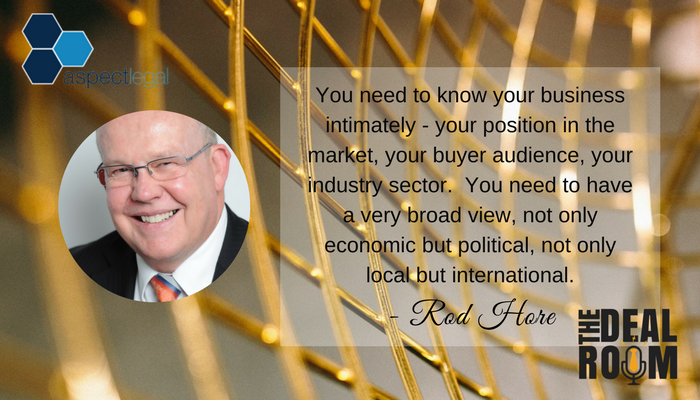 Rod: Yeah and I think it’s important to look at the characteristics of different businesses as they change in size. And here, we’re talking about services businesses. And in the global scheme of large companies they’re not very large but they have certainly got characteristics that are different from the SMEs we discussed previously. And so in this characteristic I’m talking about organizations that probably have profit above about 2 million AUD before tax. And to be able to achieve that, a business needs to have characteristics related to sustainability and management capability and position in the marketplace and so on. And the companies that get a little bit bigger than that, sometimes beyond the sort of owner-dominant type business and are moving more towards the corporate characteristics that larger businesses have. So really looking at owner-dominant and corporate. Joanna: And do you find that, in this space, often you have a different type of buyer that’s interested in these types of businesses vs the SMEs? Rod: Oh certainly! Partly because the cheque that needs to be written is larger. Therefore, there’s a different type of buyer who can write a bigger cheque. But also the characteristics of what a person is looking or what an organization is looking to achieve by an acquisition changes when the company is larger. Joanna: So I guess our SMEs quite often, you might have that range of potential buyers being, might be someone that is coming to purchase a business for them to run themselves as an individual or group of individuals but that’s less likely the bigger the business gets, right? So our pool now is looking out to potentially larger purchases. Is that generally the experience you’ve had in this market? Rod: Yeah, that’s right. So it would either be larger companies in the same industry, in the same geography, so Australian companies buying larger Australian companies. But now the characteristics might be of the buyer that might be an overseas company looking to expand to Australia. Or it might be an investment related entity such as private equity that’s looking to get into a particular sector or geography. Joanna: Okay. So tell us a bit then about the definitions that are relevant for our listeners to understand if they don’t know their way around this area. Rod: Yeah. So by comparison and contrast we talked about SMEs and quite often a small to medium company is run for the benefit of the owner and it has the characteristics of a lifestyle organization. And here we’re talking about organizations that have moved beyond that, and the leadership of the organization is looking to build the best business they can. They have got a strategy in place, they are looking to execute the strategy and they start to take on characteristics that are less about the personality and the personal wishes of the shareholders and more about the entity, the business itself. And so the larger owner-dominant businesses, and then the corporate business is characterized by, I suppose being less personality-driven but still is there, and more about I suppose what we expect of businesses which is board characteristics and strong management teams, sustainability of revenue, quality of strategy, quality of financial capacity and characteristics and so on. And those characteristics not only come but allow these organizations to be larger and to be more predictable in what they do. But it also has the impact because of that sustainability and that repeatability then the valuations and the value of these businesses goes up as well. Joanna: And I guess as well to add to that, transition can be a bit easier when you’re dealing with an organization like this because as you say, it’s less dependent on the personalities of individuals who might be the sellers, the owner-sellers in the SME examples. Rod: Yeah that’s right. And so, the transition is quite often that the management team don’t change at all. They just have a new owner and or if there are one or two shareholders maybe leaving or people changing as part of an acquisition but the bulk of the business and their depths in the management team that are able to step up and take responsibility for the new owners and take the business forward. And that just comes with size. It’s just a characteristics of size. Joanna: It’s interesting that you noted before that valuation formula increases somewhat for a larger organization. So I guess there is even more incentive for SME owners to try and get their organizations to build them into a bigger base, if they’re interested in the end value at sale. Rod: Yeah. And so quite often, a lifestyle business is actually being run to make profits for that year. And so the owner can withdraw profits for that year and sort of creating wealth as you go. Whereas once you get into the larger businesses they tend to be concentrating on equity value and rising equity value, and looking to build a business that has the characteristics that are going to give them a greater equity value. There is a rule of thumb that it’s worth sort of putting out and that this comes from the private equity world where if you look at the average of a particular sector in a country such as Australia, then the average value of that sector for the publicly listed companies when you then look at the privately owned companies that have corporate characteristics but had not listed, they would be worth about 2/3 of what the publicly listed companies would be worth. And then the privately owned businesses, the sustainable privately owned businesses, that are probably still owner dominant, they would be worth about 1/3 of what the publicly listed companies are worth. So there’s some rules of thumb that do stand up over time and show that as the characteristics of an organization change, size, and the sustainability and the repeatability of the business change, then the valuation does actually rise. Joanna: Interesting. Which obviously, I guess is why some public listed entities find it attractive to go on an acquisition path. Rod: Yeah and look depending on the industry and depending on the sector and the time frame and the objectives of the organization,acquisitions can be a very valid part of growth strategy, which I’m pleased about, given that’s the business we’re in. Joanna: Great. Okay. So I can’t remember have we provided the definitions. Have we talked about working capital yet? Have we gone there? Rod: Let me just talk a little bit about some definitions first and then they’ll come forward. So one of the things we talk about, with businesses that are owner dominant and then moving towards having more corporate characteristics is, as I’ve mentioned, sustainability. But it’s the sustainability of everything in the business. It’s not just sustainability of earnings, but it’s the sustainability of the management team, and the sustainability of the internal processes, and the strategy planning, and the ability to handle disruptions and changes. So if a person leaves, or a client is lost, or an economic condition happens it’s how an organization is structured and able to handle that so that they can continue on and be a thriving entity. And as a company gets more towards the corporate characteristics that we describe, it includes things that would make the business able to be a listed entity, a publicly listed entity if it so wished. So that might mean that moving towards an external board having audited accounts or having professional management at the top level rather than maybe people just out of the industry who have grown up into bigger jobs. And so all of those characteristics become important and are looked for by somebody coming to do an acquisition. Rod: If I could just talk about the other thing that moves along there in terms of the definitions is, the different organization is coming along to look at an organization. If it’s a larger entity and it’s going to live up to its expectation of being a more corporate entity, then that business should be ready for sale. So there should always be available to have the conversation about an equity transaction. Whereas I don’t actually recommend that for lifestyle companies because I think it’s distracting. But once it’s a larger company, it is a sign of the capacity and readiness of the organization to handle unforeseen circumstances. 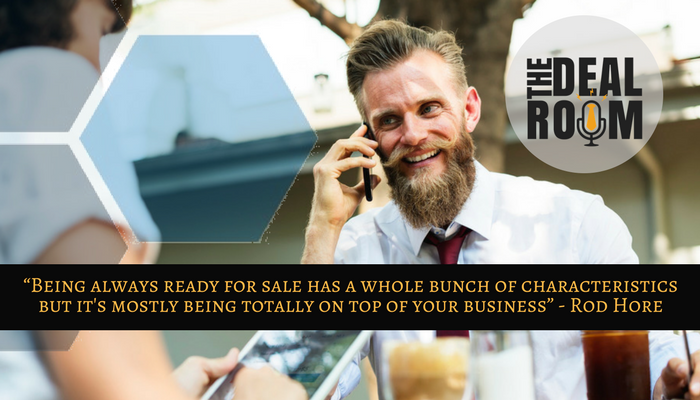 And so being always ready for sale has a whole bunch of characteristics but it’s mostly being totally on top of your business from a financial and management position in the marketplace, and so on. Joanna: And legal perspective I guess we’d say as well. Rod: Absolutely. Yeah so almost having done a mini-due diligence constantly. And so yeah. All of the legal compliance are not only in place but you can prove that it’s in place. Joanna: Absolutely. Okay great. All right. Well look, let’s work in then to what our top five things are in getting your business ready for sale. Rod: Certainly. I’ll still include that personal plans of the shareholders need to be taken into consideration. And that doesn’t apply to all companies in this sector but many of the larger businesses in Australia are still privately owned, and the founders are still actively involved in those businesses. And just like for a very small business the personal goals and ambitions and the personal readiness if you like of those people become very important in an acquisition transaction. So if the business has been sold, those founding shareholders need to be very organized personally to be able to make the decision to sell and to be able to walk away from something that’s been an important part of their life. And sometimes if they don’t have that in place, if they’re too attached to the business and haven’t thought about life after the business, that can actually stop a transaction going ahead because they’re having to think and process a whole range of scenarios that they’re not prepared for. Joanna: And would you say one of these areas as well, is sort of bringing the team and key stakeholders along with you in that thought process and that vision as it progresses. Rod: Yeah. And I do think that’s probably the second characteristic, is that the thing that an organization can do to get ready, is to have it as an active and open topic of conversation that the management team have a shared vision and the scenarios for the future are talked about, and the impact of those scenarios on the management team as a whole and on the individuals is talked about and known and so that there’s no surprise when that becomes a real life situation and those discussions are happening. The management team and the board do need to be very prepared and very organised and not have any sort of unspoken secrets if you like, because it will show through. All of those things become very visible and very public during an acquisition process and you need to have covered them off beforehand. Joanna: Absolutely. Unifying that vision, I guess that’s what it’s all about isn’t it. Rod: Yeah, it is. And look, I think it’s important to just remember the old story out of the management books about getting the right people on the bus and then making sure that those people still want to be on the bus for the journey. And that is so true. Because I think today, an M&A process is one of the more emotional business situations you can be in. And there is nowhere to hide and differences and a lack of unity will show up very quickly. Joanna: And you know it’s interesting, I mean obviously in some of these sale environments, there might be key personnel that are part of the management team that will be required to continue on with the business as part of a buy in. So it’s really important if that is going to underpin part of the value of your sale that you tick those areas off early on because quite often even in the larger organizations I find management teams are still connected in a personality sense sometimes with the underlying beneficial owners of an organization. So it’s important to introduce these concepts early enough for people to settle into them from my perspective. Rod: Yeah. No, that’s true. And look, especially if we are concentrating on service business here. And it’s not unemotional. And there are teams of people, and there’s the organizational staff who need to be motivated and kept aligned with the goals of the organization. And so the management team becomes a critical part of any acquisition transaction. You consider the recruitment industry where I concentrate. We quite often have people coming from North America or Japan or from the United Kingdom who are coming to our region to acquire companies and they need a stable and continuing management team or they, in their own hearts, can’t make a decision to acquire a company because it’s just too far from their home base. Rod: You can’t jump on a plane from London and be here to solve a staffing issue. You’ve got to have a stable local team. And if the management team is not prepared for that, then that will reflect in either no transaction or a reduced price on the transaction. Joanna: Great. OK. All right so then what’s our third top tip in getting ready for sale? Rod: We haven’t talked about deal structures for larger companies. So in the previous podcast we talked about a multiple of profit and earn out, and the discussions on working capital and so on. And all of those things still apply. But it is probably a little more rigorous and a little more defined, probably less creativity in the way deal structures are done with larger companies. So if you can imagine buying a listed company, you can buy a listed company by effectively writing a cheque and the company is yours. There is no discussion of earn out. There’s no discussion of working capital and all those things because that’s taken into account of what the value of the company is. It’s a little more creative for privately owned companies where it’s still a multiple of profit but it’s assumed the working capital will be included in the minimum working capital requirements. It’s a very clear definition not on actually normalized profit before tax but on evatar because you are expected to have much more sophisticated accounting and therefore that is easily defined and there is probably less emphasis on the deal structure where there may still be an earn out and there may still be some payments in the future based on performance but that’ll probably be less creative and more structured. 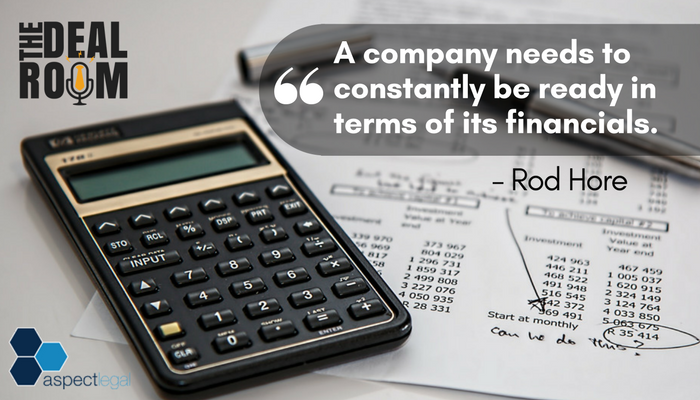 And to be able to achieve that, a company needs to constantly be ready in terms of its financials. We are still surprised at how, as companies grow they don’t necessarily increase the sophistication of the financial function within the organization. Smaller companies worry about the profit and loss statement and pay attention to the cash flow. When you get to be a larger company, the balance sheet becomes even more important and having a very detailed and structured and predictive profit and loss balance sheet and cash flow becomes an important characteristic of showing how prepared you are and how sophisticated you are as an organization. And many organizations in Australia fall over on that. So the third tip is to have not only clean financials but appropriately sophisticated financials and great governance around that so that how your financials are prepared, the quality of them and the payments you make, the compliance you have within your financial requirements are all very clearly identified and able to be proven. Joanna: Great. All right. Wonderful. And then what’s the fourth area we should be looking at here in getting ready for a sale? Rod: I want to talk about how an organization can’t be insular when it gets large. We quite often see with small to medium businesses that it is OK for the owner to basically shut themselves off from their industry and just run their business. If you want to be seen as a player in the market and as a contributor in the market and having a position in the marketplace, then as a larger company you can’t do that. The old Enron story about the smartest guys aren’t in the room I think applies here. So even the management team, the board, they constantly need to be having external people looking at their business so that they are realistic about their performance. They’re realistic about their position in the market and they’re realistic about their buyer audience. They know what type of company might come and look at them and what that company might be looking for. And that requires them to know their business intimately. It requires them to understand their industry sector intimately. And it requires them to have a very broad view, not only economic but political, not only local but international. And so to do that, they’ve got to be outside their business. They’ve got to be participating not only in the industry but participating broadly around the world to make sure they know where they sit. If they have somebody who approaches from I don’t know Japan or the U.K. or something, they need to know what that means and what the implications are for the company that’s approaching them. Joanna: So with your work in the recruitment sector then what is your advice in that particular industry for businesses that are in these medium to large size who are wanting to, who perhaps aren’t fully appraised of where they sit in the market and don’t really have a good understanding about who their buyer might be who the potential buyers are. What are ways that they can really start to get to understand these areas? Rod: I think first of all, they need to do things like benchmark their business so that they know whether they’re any good or not. So it’s no good saying we’re the best at what we do and then you run some benchmark numbers across them and you find out that they’re just average. So that’s a bit embarrassing. But I think people need to just get out. And that means they need to travel and talk to people. They need to get external people to come in and look at their business and look at particular aspects and not be afraid of what that uncovers. I personally think one of the advantages of living in Australia is that from a business strategy point of view we tend to follow what happens in other countries especially the United States because that’s the driver of most business strategy in my opinion. And so, go to conferences in the United States and travel to the other parts of the world. Look at what their issues are and then you can come back to Australia and say well actually they’re probably going to be our issues within the next two to five years and be able to talk about that and talk to your staff and talk to your management team about those things so that as an organization you’re ready and prepared. Joanna: That’s a great tip. I love that one. That’s a really good one. OK. Well I think we’re up to our fifth then. What’s our fifth and final tip in relation to getting a business ready for sale? Rod: This is an unusual one maybe, but people concentrate and think that selling the business is all about maximizing my profit because at the end of the day who buys my business is going to pay a multiple of profit and that is true. But there is a lot of courting that needs to go on before that happens. And not only personality, but the attractiveness of the business is very, very important. And so one thing you might find is that organizations that are starting to think about or possibly thinking about selling will quite often, increase the amount of public relations they do. They might speak a little bit more at conferences they might do those sorts of things. And I think that is really valid because you have to position the business. You have to position your business publicly in terms of what you do and what you’re good at. You need to make the business easy to find. And you can’t be precious about things that are very, very important to you, internal to the business, but are probably less important in the broader conversation. And so all of that sort of attractiveness of making yourself easy to talk to and maybe even sharing information about how your business is going becomes really, really important for an organization that is coming to look at a larger set of entities and working out who they’re going to go and approach. If they can’t get a feeling for you in the public marketplace or in the industry itself then they’re probably not going to go and knock or tap on your door. Rod: So it’s unusual. So we talk about sort of the opposite of what I’ve talked about before in that, a lot of being a larger company is about having ‘ great governance and great financials and all those sorts of things. But you’re actually still got to have the personality as a company. Joanna: That’s interesting still putting yourself out there. Joanna: Yeah, as a personality of the business I guess to a degree. Joanna: Great! Okay. All right. Wonderful. So just as a recap there we talked about the five top areas that businesses should be looking at in preparing themselves for sale if they’re falling into that medium to large category which is: having a personal plan, having a great management team and a shared vision, having clean financials and great governance, knowing your business intimately – so I think there we talked about benchmarking and your position in the market and being realistic about the buyer audience. And then finally positioning the business – getting out there, making the business easy to find. Making sure it’s got a public profile that a buyer will be able to pick up if it’s looking for you in the market. Joanna: So, great! Thank you so much for coming in today Rod to talk to us in this second part. 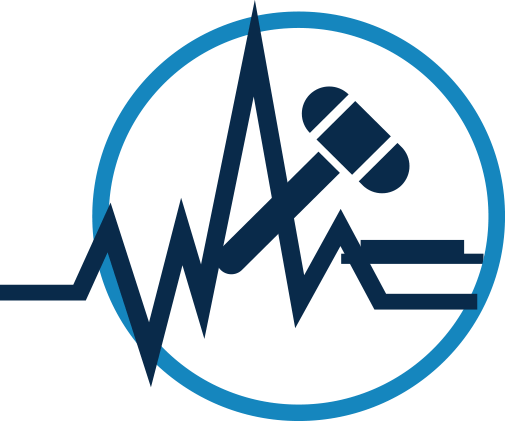 I think you’ve shared a lot of valuable insights and of course if any of our listeners want to read more about the insights you provide, where should they go? Rod: Yeah contact details are available on our website as well as a lot of blogs which relate to this type of conversation at hhmc.com.au. Joanna: And you guys push out a lot of content don’t you? I see your content and it’s really good content particularly, and I think it’s probably applicable generally to services businesses but obviously particularly to recruitment businesses. Rod: Yeah. We do find that people from other service industries follow our content and seem to get some value out of it. So we’re really pleased about that. Joanna: Great. OK. Wonderful. Well look once again thanks so much for coming in again Rod and hopefully we’ll have you back again soon to talk about some more of these areas of interest to our listeners. Rod: Thanks very much Joanna.